Napa Valley wine tours are great for all seasons. Yes, we definitely mean all seasons – even in the winter months. Anytime is a good time to visit this world-renowned wine region in California. The coldest months in the Napa Valley are usually December, January and February. Winter in the region is where you’ll experience intermittent seasonal rains, which are then followed by blue skies and rays of sunshine. The changes in the weather during this season make Napa Valley all the more beautiful. Napa Valley in wintertime offers a splendid beauty that is otherwise different from when you visit during the summer, spring, and autumn seasons. Traffic in the winter season is usually light, the pace is slower and not so busy, and many hotels are offering excellent discount specials. At this point, wines are barrel-aging in caves and cellars, ready to be savored. It sounds like wintertime should be the best time to do your Napa Valley tours! When you think of winter, you may automatically think of some snow-covered pine trees, snow-capped mountains, and snow-piled vistas, anything cold and white – the common, traditional visions of the season. However, you won’t see anything of these in the Napa winter. Yes, the vineyards may be barren and dormant for the wintertime, but you’ll be surprised by the amazing colors that Napa offers during this season such as the vivid yellows of the wild mustard blooms and shades of emerald green. The bright colors of yellow and green during the wintertime means that it’s officially the Cabernet Season, which goes on until April. Visitors who are lucky to experience wintertime in Napa have easy access to the best wine, food, arts, entertainment, and wellness amenities, as well as great discounts offered by many hotels in the region. In the Cabernet Season, tastings and heartier fares won’t be complete without sipping and savoring the bold flavors of Napa’s flagship wine, the Cabernet Sauvignon. This wine, as many tourists and winemakers themselves claim, is perfect for cozying up during these cold nights. No wonder winter is no longer a season in the Napa Valley, but instead an awesome celebration. You wouldn’t want to miss out on the Cabernet Sauvignon for sure, but there are other fun things you can do in the Napa Valley during the winter season. This is especially true in regards to the unique beauty this season brings. However, there’s no better way to marvel at these wonderful sights than by going on a hot air balloon ride. When you decide to go on a hot air balloon ride, you may see several hot air balloon flight companies in the Napa Valley. However, only Balloons Above the Valley (BATV) offers sunrise hot air balloon rides packages that will definitely warm the cockles of your heart during the winter season. Aside from warming your heart, our packages also satisfy your bellies and invigorate your senses, as well. Of course, you cannot leave for your hot air balloon flight feeling cold, lazy, and hungry. You will enjoy our delicious pre-flight coffee and pastries to keep you alert. Next, you’ll be driven to the site where the hot air balloons are being inflated. Once the balloon finally rises, you will be able to hop in to what will become the ride of your lifetime. In the crisp, cool winter morning winds, you will know why the beauty of the Napa Valley is best viewed from up in the sky. You will get to marvel at the rows of bright, vivid canary-colored wild mustard blooms that upstage the sleeping vineyards, and several shades of emerald green that make for a gorgeous carpet on the misty hills. These brilliant, intense, and beautiful colors are basking the under the glow of the winter sunrise. You swear you will never see the other side of Mother Nature’s beauty as from the Napa Valley in the wintertime. Of course, don’t forget to take pictures of the beautiful, wondrous winter sights of the Napa Valley with your camera and smartphone as your own personal souvenirs. These pictures will be treasured for years to come. Your flight is enjoyable but you may be somewhat a little sad that the airborne trip will be over. Don’t be sad, though, because a delicious post-flight champagne brunch is ready for you and your friends to enjoy. This is also the opportunity to celebrate the fun and truly unforgettable hot air balloon flight you enjoyed just moments before. Aside from the hot air balloon rides, pre-flight breakfasts and post-flight champagne brunches, there is so much more that Balloons Above the Valley offers. Our other all-inclusive packages include winery tours in Napa and Sonoma, a 7-hour wine tour from San Francisco in the comfort of a limo bus, continental breakfast with mimosa, stop at the vista view of the Golden Gate bridge, picnic lunches at the winery, tours at the vineyards and winemaking production, ferry rides, and so much more. 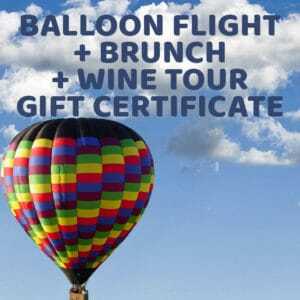 BATV also offers packages and accommodations for proposals and weddings, group and corporate tours, and special offers for those who want to enjoy exclusive hot air balloon flights and private tables at our post-flight brunch celebration. You can also purchase our Weekday Gift Certificates if you want to give a special, memorable gift for your loved ones on their special day (or any time of the year). For more details of our packages and how to book your reservations on them, check out our webpage: http://balloonrides.wpengine.com/tour-options-pricing-reservations/. You may also contact us at 800-464-6824 or send queries to our e-mail: info@balloorides.com. We will be glad to answer your questions about pricing as well as assist you in booking your reservation. There are many delightful perks and amenities that you’ll enjoy when you decide to do Napa Valley wine tours in the winter. Aside from the beautiful scenery, the relatively leisurely pace, the excellent discounts, and the fine Cabernet Sauvignon, wintertime also means this is also the best time to ride on a hot air balloon! Balloons Above the Valley is more than ready to give you the most wonderful, exciting and unforgettable sunrise hot air balloon rides during your Napa Valley Wine Tour in the winter or in any other season.